Durango Silver bought the remaining Bisbee Turquoise collection from Cecil Mickelson's family in 2002. Cecil was Bob Mathews brother-in-law and was Bob's partner in the Turquoise business. They both lived in Durango during the time they were getting the Bisbee Turquoise out of the mine. We own one of the largest Bisbee Turquoise collections in the world and have the largest selection of Bisbee Turquoise Cabochons. Since this time we have been buying up every collection of Bisbee Turquoise or Bisbee Turquoise Cabochons that comes our way. In 2010 we purchased another large collection of Bisbee Turquoise and Bisbee Turquoise Cabochons. 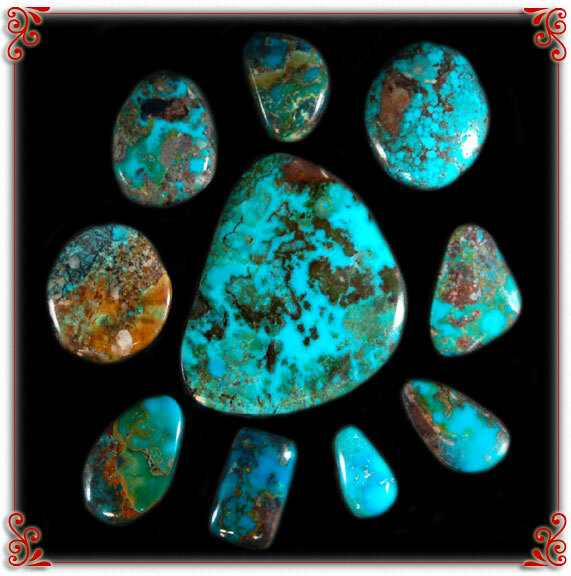 In 2011 we purchased three large collections of natural Bisbee Turquoise that included extra large nuggets of Bisbee Turquoise that we cut into the perfect Bisbee Turquoise cabochon for everyone. Dillon and John Hartman have cut many, many Bisbee Turquoise cabochons over the years and know exactly what it takes to cut that perfect Bisbee Turquoise Cabochon. We cut our rough material into Bisbee Turquoise Cabochons and we also inlay Bisbee Turquoise into our own Jewelry designs. When you are look for the best in Bisbee Turquoise Cabochons for your collection or your jewelry, look no further. We also purchased the Mickelson Jewelry companies old molds from the days when had a Jewelry manufacturing company just north of Durango. Durango Silver Company cuts Natural Bisbee Turquoise Cabochons and has whichever look of Bisbee Turquoise Cabochon you would like or need. Thank you for reading and learning about Bisbee Turquoise Cabochons, maybe this will help you purchase your first Bisbee Turquoise Cabochon.